As part of the ‘Safe and Secure’ work stream of the Blackburn Blackburn Business Improvement District, the BID supports the running costs of the award winning, Blackburn Businesses Against Crime organisation in the town centre. This includes an online intelligence sharing, communication software platform which enables businesses and the police to share information to help report, detect and deter crime. BBAC Chair, Ronnie O’Keeefe is the Soft Services Manager at The Mall, Blackburn. He shares his experiences of working with the Blackburn BID, Lancashire Police and the Community Safety Partnership team at Blackburn with Darwen Borough Council. “Over the last five years the Blackburn Businesses Against Crime organisation has gone from strength to strength. 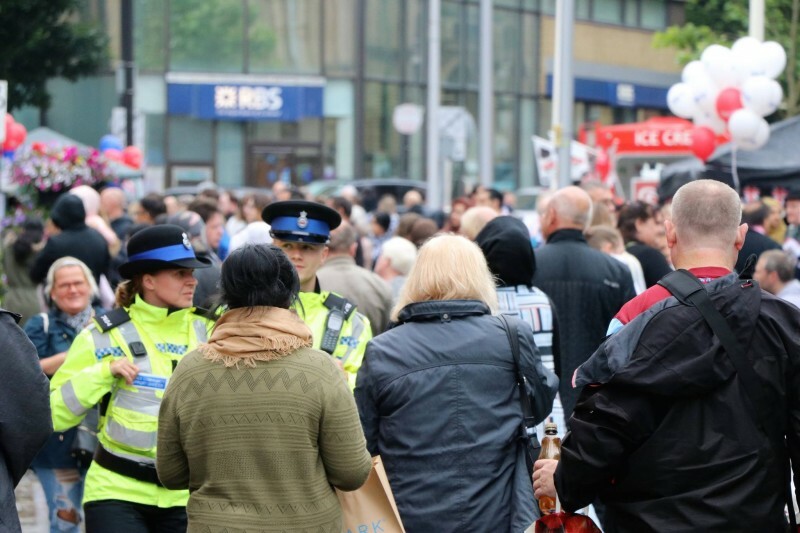 After entering into a partnership with Blackburn BID, the extra funding granted via the Safe and Secure BID group has enabled us to develop many successful projects and initiatives to reduce business crime and ASB in the town centre. The BBAC has been recognised nationally for some of the projects and won best BUSINESS CRIME REDUCTION PARTNERSHIP in 2014 for crime reduction project operation DAD Detect and Deter they also won best partnership award again in 2017 for their multi agency partnership work in dealing with town centre crime issues. BBAC works to support business in many ways including the shop watch radio scheme, this now has over 100 radio users in the town centre and retail park, and with support and funding from the BID we have a very active and well used DISC web site with over 200 regular users sharing the information on active offenders across are area . The last five years has seen a steady transformation of the town centre and with that growth we have new challenges in both crime and ASB. BBAC and the BID work very closely through the safe and secure stream and this part of the BID has now funded two Police Community Support Officers for the last 4 years. These two PCSOs are dedicated to covering Townsmoor retail park and the Town centre, this is in addition to the two other PCSOs and the police team. Pub Watch channel and subsidised radios. The BID/BBAC also work very closely with the local authorities safety partnership on issues like shoplifting and ASB this working together as a partnership has seen the police achieving over 20 CBOs (Criminal behaviour orders) being issued to the top town centre offenders, this has seen a a steady drop in reported ASB in the town centre and Cathedral area. The resurgence of the night economy brings its own issues and challenges around ASB during the evening and this will be are focus for the year ahead. PUB WATCH radio link with CCTV and the police has now been set up, again funded by BBAC and the BID and the publicans in the town will run the scheme going forward. The BIDs commitment and support on all crime issues in the town centre through the Safe & Secure Working group has been a significant help in tackling business crime issues. This must be a significant influence in changing perceptions and attracting some of the new businesses to the town. I am looking forward to the continued support and development of new initiatives in the coming year and will be urging businesses to vote YES to renew and maintain the BID when the vote comes up in October. PARTNERSHIP WORKING IS THE ONLY WAY FORWARD NO ONE PERSON OR GROUP CAN TACKLE THE PROBLEMS ALONE.